JVC is making it easier to hook-up an iPod to a flat-panel TV with new sets that contain a dock for the popular music player, it said Saturday on the eve of the International Consumer Electronics Show. The four new models feature the dock at the base of the set and will display an iPod control menu when a device is connected. Through the menu users can use the TV’s remote control to call up songs, music shuffle or videos. The remote control has a circular keypad with a control scheme that mimics the iPod’s control wheel. The set can also display photos or regular TV during music playback. Two of the sets, the 32-inch and 42-inch screen-size models, will be available from March with a 47-inch model available in April and a 52-inch model available in the middle of 2008, JVC said. Pricing for the TV sets was not announced. The new TVs are among a range of new products JVC is launching at CES that include docks for the iPod. 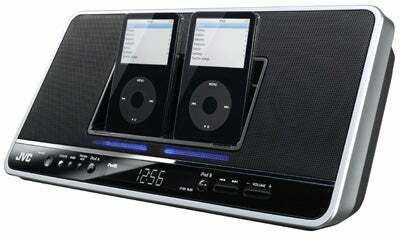 The PN7 is an iPod docking station that can accept two iPods. Sitting side-by-side in the dock the iPods can be simultaneously charged while music can be selected from either device and played back through the built-in speaker system. There’s also an AM/FM tuner and an analog audio input for connecting other audio sources for playback. The PN7 will be launched in April and will cost $150. JVC also announced two new mini systems and a micro stereo-system that includes an iPod dock. The MX-KC68 system has a 400-watt speaker system with subwoofer while the MX-KC38 has a 220-watt speaker system. The former of the two will be available in March for US$200 and the latter will be launched a month later for $180. The UX-GP5 is a three-piece micro system that has a flip-down iPod dock that is normally concealed when not in use. The system will be launched in March and will cost $150.